A protester against King Gyanendra's absolute rule in Nepal has been shot dead in the west of the country while the capital Kathmandu was under curfew. 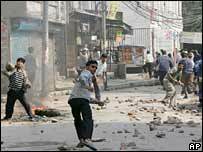 In another protest, in the southern town of Bharatpur, troops opened fire on some 25,000 demonstrators. At least three protesters and four police officers were reportedly hurt. 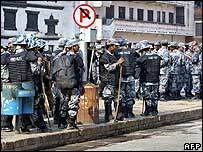 After the day's unrest, officials said the Kathmandu curfew would be reimposed on Sunday, thwarting plans for a rally already postponed from Saturday. The rally's organisers, from Nepal's seven-party opposition alliance, had delayed the event faced with the curfew and with mobile phone networks being cut. Why hasn't the West taken any interest in the plight of the Nepalese? The man killed in Pokhara, 200km west of Kathmandu, had been attending a pro-democracy rally, Communist politician Yogesh Bhattarai told Reuters news agency. The dead man was named by Nepalese newspaper The Himalayan Times as Bhimsen Dahal, aged 32. A security source in Pokhara confirmed the death but did not comment on who had shot him, the paper added. Demonstrators blocked a road with burning tyres and chanted slogans against the security forces after the incident. According to the newspaper, government offices were seized during the unrest. In Bharatpur in Chitwan province, meanwhile, some of the 25,000 protesters set fire to buildings as they confronted riot police, reports said. "Demonstrators went on a rampage as they set on fire various government offices and clashed with police for a whole day in Chitwan," Narayan Sharma, a local journalist, told AFP news agency. Riot police were forced to retreat from the main square as the unrest flared, an unnamed government official told AP news agency. On Friday, the second of four planned strike days, at least 150 anti-government protesters were arrested in Kathmandu. Meanwhile, King Gyanendra has stressed the need for peace. "Let us all pledge today to devote time for establishing permanent peace," he told an international conference of Hindus in southern Nepal. However, he made no direct reference to the Maoist violence or the street protests by the opposition parties. King Gyanendra seized absolute power in Nepal 14 months ago. He has said he was forced to make the move because of the growing Maoist insurgency that has killed more than 10,000 people since 1996. Maoist militants launched attacks in the west of the country overnight, leaving at least five people dead. The militants attacked security bases and government offices, the army said, striking in Butwal, 300km (185 miles) south-west of Kathmandu and Taulihawa, 340km to the south-west. At least one civilian and two militants are believed to be among the dead in Butwal.